How do I forward iCloud email? I normally use Gmail, but I set up an iCloud email account just so that I could directly email webpages and photos when using my iPhone. I didn't expect people to reply, but they did and I only found out about it months later! How do I forward iCloud email? The short answer is that you apparently need to do this on a computer - I couldn't find any way to do it on iPhone or iPad. On a computer, go to iCloud.com, log in, and click on Mail. Then click on the Gear icon at bottom left and choose Preferences. That will let you set up forwarding. 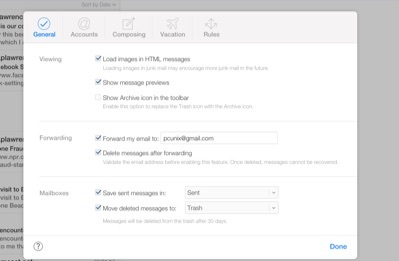 -> How do I forward iCloud email?